The recent public statements by Rev Vendaruwe Upali Thero, Anunayake of the Asgiriya Chapter at a celebration of Mr Gotabaya Rajapaksa‘s birthday, Ms Vijayakala Maheswaran, former State minister at a public meeting in Jaffna, and a personal attack by retired Rear Admiral Sarath Weerasekara on Dr Deepika Udagama, Chairperson of the Human Rights Commission of Sri Lanka (HRCSL) deserve articulate public condemnation by us all. Rev Upali exhorted Mr Rajapaksa to give leadership for good governance, even if he has to be “a Hitler” to do this. Some weeks later Mr Weerasekara denounced Dr Udagama as an LTTE supporter and a traitor to this country, with the battle cry “death to traitors”. Ms Vijayakala Maheswaran called for a return of the LTTE to ensure the security protection and progress of the people of the North, and especially their women and children. These statements have a common link. Delivered on public platforms, they encourage support for authoritarian and dictatorial governance as a legitimate and acceptable form of good governance. They also spread messages that directly or indirectly advocate the worst forms of violence, intolerance and hate. Such statements seek support for the establishment of a Sinhala Buddhist majoritarian State and a minority Tamil Eelam respectively, in a land that has since antiquity been home to a diverse population of many communities and that has also experienced the horrors of armed conflict, in the name of restoring ethnic and religious identity. Ms Maheswaran’s statement denies a reality that the whole country and the world knows: a dictatorial and authoritarian LTTE regime brought violence, destruction and suffering to the Tamil community and all our people. These spoken and published exhortations seek to trample and eliminate the core values of a religion that the Buddha taught should be based on non-violence and sensitivity to human anguish. Centuries ago, the Buddha explained in his discourses, a message included with clarity in the great text, the Dhammapada, that hatred, violence and triumphalism only breed hatred and more violence. This, he said, is a lived reality, ‘as the defeated live in pain’. Messages advocating hatred, violence and authoritarianism from a senior member of the Buddhist clergy, a former member of the armed forces and a member of parliament, that are now in the public domain, must be recognised for their destructive power. They must be challenged and also rejected by us as a people who want progress and development, without the evils of abuse of power, or armed conflict. Human history shows us that dictatorships and hatred for the diversity of people bring war, destruction and suffering, rather than benevolent governance to the people. We also need to denounce a growing culture that distorts the responsibilities of persons who hold public office in the country. We have become accustomed to forgive and forget the misdeeds and corruption of ‘nice and good’ public officials who bend their knee to politicians, seeing them as helpless victims of a debased political system. We have also legitimised personal attacks on holders of public office who try to fulfill their professional and public duties with personal integrity and courage. The recent denunciation of Dr Udagama as an apologist for the LTTE, is symptomatic of this vicious culture of denigration. Dr Udagama is an academic and a professional who has held public office with courage, dignity and independence, and deep commitment to public service. She has conformed to the highest standards of personal integrity and is widely respected for these qualities. She has given leadership, during her brief tenure as chairperson, and helped the Commission to fulfill the promise of the 19th amendment, in establishing independent commissions. Sri Lanka’s HRC under the previous regime was downgraded by both the International and Asian bodies monitoring the work of Human Rights Commissions. The work done by our own HRC has received recognition recently as one of the best among countries that have set up such agencies to help deliver justice, and implement the rule of law. The recent attempt to attack her credibility and public service must be denounced for its viciousness and untruthfulness. 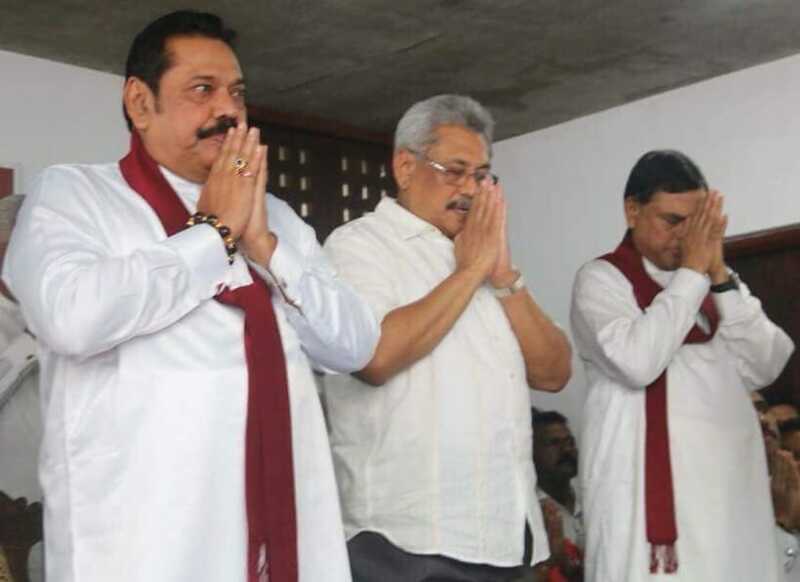 In 2015, a majority of our people, including at least a third of the Sinhala Buddhist voters, rejected a former political regime and its leadership. The late Rev Maduluwave Sobitha Thero helped to create a movement that focused on the need for change. The period after national elections should have been a time to strengthen the links between participatory democratic governance and community wellbeing, with efficiency and political commitment. The government has failed to live up to the promises made to the people. These failures are now creating the impression that authoritarian dictatorship and that type of leadership is the solution the country requires, and demands. We must recognize that opportunities have been missed, but give credit for some minimal positive changes. The 19th Amendment, despite some limitations, forged a consensus and was enacted into law. The establishing of independent commissions, especially the HRC, and the passing of a Right to Information Act with a Commission responsible for implementing it, have set norms, standards and procedures that have benefited the public. Many of the aberrations of the past, like abductions and extrajudicial killings of political opponents and media personnel are no longer an accepted dimension of governance. However the President, the Prime Minister and the government have failed to fulfill the core commitments to the public they undertook when they were elected to office. Looking over their shoulders constantly at the joint oppositions discourse, the government and its leadership have repeated past mistakes, and have become trapped in identity politics. Despite protests in many quarters, and demands for a new political culture, we continue to witness political patronage in appointments, widespread misuse of public funds, inefficiency and corruption, and political interference in public administration. Consequently those who hold public office and are accountable to the public, have sometimes become partners with politicians in the failures and inefficiencies of governance. Prosecution of emblematic cases of corruption and violence continue to be hampered by a paper trail of investigation that is never ending. In other countries, as we have seen recently, such cases are investigated and prosecuted. In the embedded adversarial political environment of this country, there is always a battle cry that criminal investigations are acts of political vengeance, prejudicing the administration of justice through legal procedures. In a novel interpretation of our Chapter on Fundamental Rights, lawyers have argued that protection from an imminent violation of the right to freedom from arbitrary arrest means that a petitioner can go to courts and prevent investigation of criminal cases for prolonged periods of time. Recognizing these appalling inadequacies in governance and public administration at this time, must not however encourage us to advocate for dictatorial and authoritarian leadership that will create more suffering for our country and our people. History has shown us that dictators destroy their people. We know that a Chandashoka cannot become a Dharmashoka by adopting a different garb, unless he rejects violence and abuse of power, and understands and is guided by the norms of democratic governance. Following the path advocated by Upali Thero, Mr Weerasekara or by Ms Maheswaran, is surely a path from ‘eliya to andura’ (from light to darkness). It has every prospect of becoming a ‘vipath maga’ (road to disaster) for our country and our people. Dr. Geedreck Usvatte-Aratchi, Bishop Duleep de Chickera, Prof. Arjuna Aluwihare, Mr. Chandra Jayaratne, Ms. Suriya Wickremasinghe, Ms. Manouri Muttetuwegama, Prof. Gananath Obeyesekere, Prof. Ranjini Obeyesekere, Mr. Danesh Casie Chetty, Dr. Upatissa Pethiyagoda, Dr. Gameela Samarasinghe, Dr. Dinesha Samararatne, Mr. Faiz Ur-Rahman, Mr. S.C.C.Elankovan, Mr. Priyantha Gamage, Mr. Javid Yusuf, Mr. Ananda Galappatti, Rev. Dr. Jayasiri Peiris, Mr. Sanjayan Rajasingham, Mr. Pulasthi Hewamanna and Ms. Shanthi Dias. Should Unsavoury Things Continue Unabated? Another howl from a servile set of yahapalanistas. A seeming tactic by these buggers to make statements in periodic intervals to repeat anti JO and particularly anti Gota rhetoric apparently thinking that Goebbelsian theory of repetition would stick (like in 2015). They seem to have appointed Mangala Samaraweera as their communications (read propaganda) adviser. Yahapalanaya created a situation that you guys let alone start discussions. If Ballige putha got relected, by today, things would have been gone that far banning lankens in international podium AS had been the case by end of last phase of 2014. Let truths to be spread than the blatant lies about the current men – thanks to RW and Mr SIriisen ballige putha Rajapakshe have saved their lives. Even today, ballige putha Rajapakshe to work with Pathalaya to take a revenge is not overlooked. All nature shoudl punish them if not today in the days to come. Then only our people can see it further. Where is the nool on GR’s hand? Surely he could not have eschewed superstition! Dear FF it is on sided that you do not see the political motives behind the FCID and other actions. It is also untrue that dictatorship destroys a country look at Singapore and also the Eminent Reverends only need to look at the King’s of Olson their Bible. The FF is not perfect then. It seems to take sides.